Honda Aircraft Company announced today that the HondaJet received its type certificate from Brazilian National Civil Aviation Agency on August 8, 2017. The announcement was made at the annual Latin American Business Aviation Conference & Exhibition (LABACE) 2017, being held at the Congonhas Airport in Sao Paulo from Aug. 15 to 17 where a HondaJet is on static display. "We are excited to achieve Brazilian certification for HondaJet," said Honda Aircraft Company President and CEO Michimasa Fujino. "We are eager to respond to customer interest in one of the largest business jet markets in the world." Honda Aircraft appointed Lider Aviacão as the exclusive dealer in 2015 to provide sales, service and support for customers in Brazil. Based in Belo Horizonte, Lider operates more than 21 fixed base operations (FBOs) throughout Brazil. "The type certification is a tremendous milestone for the Brazilian market," said Eduardo Vaz, CEO for Lider Aviação. "The aircraft is particularly ideal for intra-Brazil travel, connecting all the major cities, with the comfort, speed and high performance only found in the HondaJet." The HondaJet is the fastest, highest-flying, quietest, and most fuel-efficient jet in its class. The HondaJet incorporates many technological innovations in aviation design, including the unique Over-The-Wing Engine Mount (OTWEM) configuration that dramatically improves performance and fuel efficiency by reducing aerodynamic drag. The OTWEM design also reduces cabin sound, minimizes ground-detected noise, and allows for the roomiest cabin in its class, the largest baggage capacity, and a fully serviceable private aft lavatory. The HondaJet is equipped with the most sophisticated glass flight deck available in any light business jet, a Honda-customized Garmin® G3000 The HondaJet is Honda's first commercial aircraft and lives up to the company’s reputation for superior performance, efficiency, quality and value. Honda Aircraft Company is a wholly owned subsidiary of American Honda Motor Co., Inc. 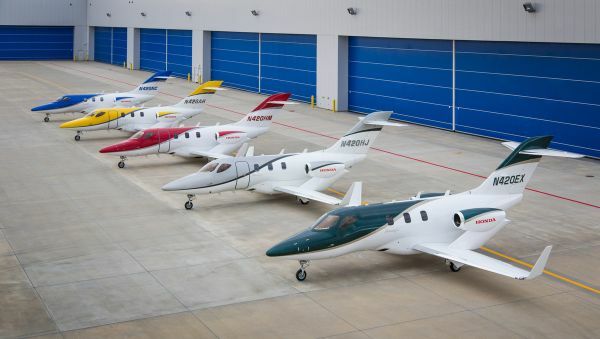 Founded in 2006, Honda Aircraft is responsible for the design, manufacturing, sales, service and support of the HondaJet. The company’s world headquarters is located in Greensboro, North Carolina, the birthplace of aviation. The challenging spirit upon which Mr. Soichiro Honda founded Honda Motor Co., Ltd. is alive today as Honda Aircraft fulfills one of Honda’s longstanding dreams to advance human mobility skyward.